For my mother, who died one year ago today. She always said this was her song. She was 12 when the movie A Summer Place came out. I remember she said she had a adolescent crush on Troy Donahue. I think this was one of those movies that evoked memories of a specific time and place, of summers spent by the lake, of new found freedom and loves. All I know is that this movie, this song, somehow shaped her. I'm remembering for her. And so my Mother-That-Was, since I can't pick up the phone and hear your voice (which I ache to do, just that, hear your voice), I transmit this song for you. I post it here, to have it be played repeatedly, and somehow this message that I love you and miss you will travel on sound waves through space, to find you, your dispersed particles of energy, to coat, surround and bind those particles if only for a moment, as the sound washes through you and over you, and you'll remember, that once, long ago, you had a summer place. 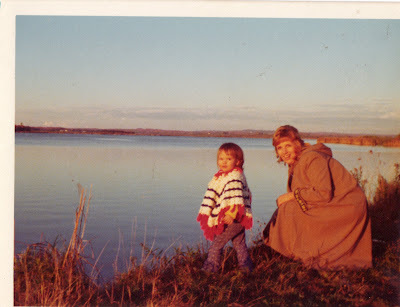 Me, age 18 months with my mother, Janine, October 1972 in Granby, Quebec. What an thoughtful and amazing way to honor your mother. It was 5 years last month since my own Mama passed amd while I no longer have the physical aches to pick up the phone and call her, I do miss her in a quiet way. Hugs to you and be gentle with yourself. what a lovely way to remember your mom, and what a sweet picture. Beautiful, beautiful, beautiful tribute. I hope the day wasn't too tough for you. i don't know what made me click onto this post today, but when the music started, first goosebumps, then tears. so beautiful.